I worked at the toughest middle school in Pasadena, Eliot Middle School, for six years as a Behavior Aide. My duties required me to deal with discipline and discipline problems. In that time, I realized that one of the major causes of discipline issues was the lack of a positive outlet for kids. Let's face it, kids have a lot of energy, and the truth is that they're either going to use that energy in a positive way, or a negative way. 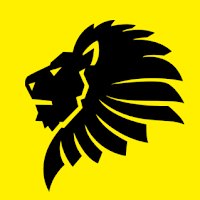 With that being said, I started putting together my Lions Roar Program a few weeks ago. I'm happy to announce that it's ready to go! I made the decision that this fitness and self-defense program would be FREE and solely run on donations and sponsors. I've been lucky to have opportunities, and I want to do my part to make sure that kids in and around the Pasadena area, despite their economic situation, also have some opportunities. My Lions Roar Program will focus on developing a foundation of physical fitness with self-defense applications in order to enhance self esteem, self discipline, develop a sense of honor and community (team work). I will only be able to take in 10 kids for now (ages 7-12). It will be free to join. Donations will be accepted but not required. You can donate in person, or via PayPal. If you would like to enroll your child, e-mail me at CoachRollie@gmail.com. When: Sundays at 10 a.m.
Feel free to e-mail me with any questions. 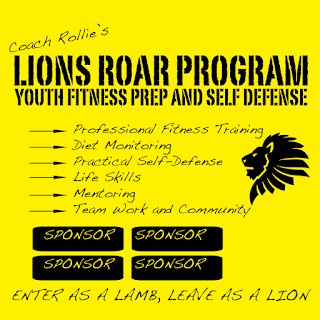 If you would like to be a sponsor, I'd like to add your logo on the Lions Roar Program creative (banner/flyer).